I have the same birthday as that of Mama Mary. 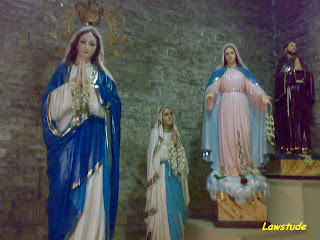 I always believe that Mama Mary always guides and keep me safe. So when I learned that I have passed the Bar last Tuesday, I prayed and visited her images at the San Nicolas de Tolentino Cathedral where this picture was taken. I have spent Holy Thursday and Good Friday entirely at home. These two days gave me opportunity to reflect and improve my relationship with God. Honestly, I do not have immediete plans yet on what to do and what career paths to pursue now that I have become a lawyer. Passing the bar has opened so many doors for me that I seek the guidance of our Lord to lead me where He wants me to be. "In God himself who has made us what we are an given us new lives from Christ Jesus; as long ages ago he planned that we should spend these lives in helping others." These couple of days gave me the opportunity to thank the Lord and pray. I thank Him for all the good things that He has given to me and my family. I thank Him for keeping me safe in my travels and for giving me family and friends that truly support me. I also thank Him not only for my success but also for the success of two of my friends, Atty. Jo Anne and Atty. Jenny who passed the Bar Exams also on their first attempt. Then I pray that may He comfort my friends Edward, Lei, Rico, Aris, Claire, Raygan, Tina, Karen and Onie who have failed to pass the Bar. I believe that everything shall be given to them in God's time. "I glorified you on earth by completing down to the last detail what you assigned me to do."